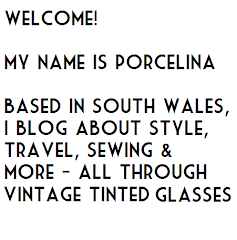 For top of the range vintage reproduction clothing, it's no secret that I'm a fan of the House of Foxy. 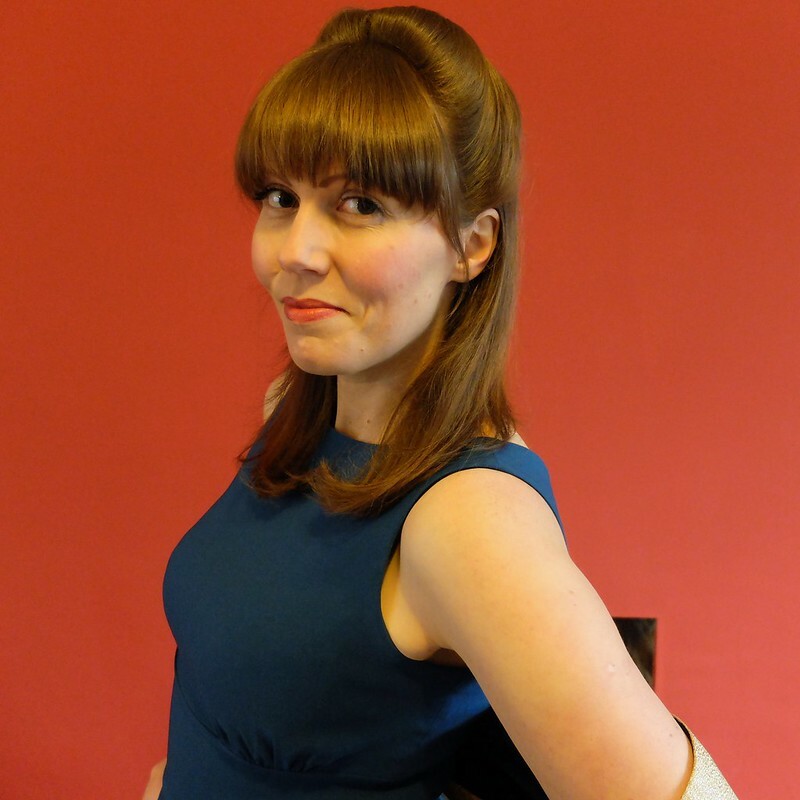 I recently picked up their Betty Swing Dress in the sale, helped along with some Christmas vouchers. 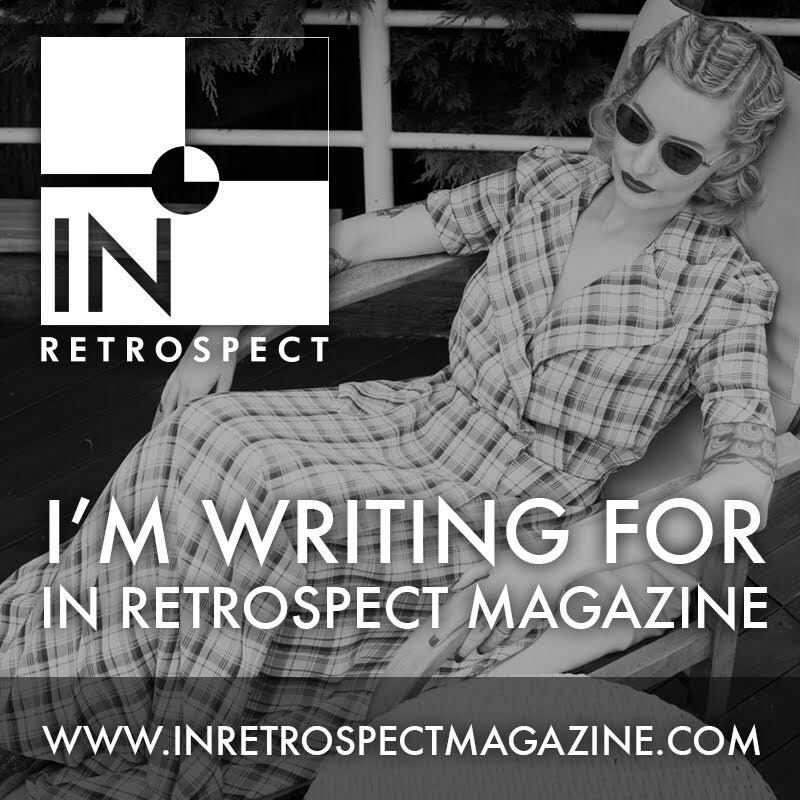 The dress is based on a pattern from the 1959 to 1962 era, or 'Mad Men' era in today's shorthand. Available in both red and teal, I went for the teal. 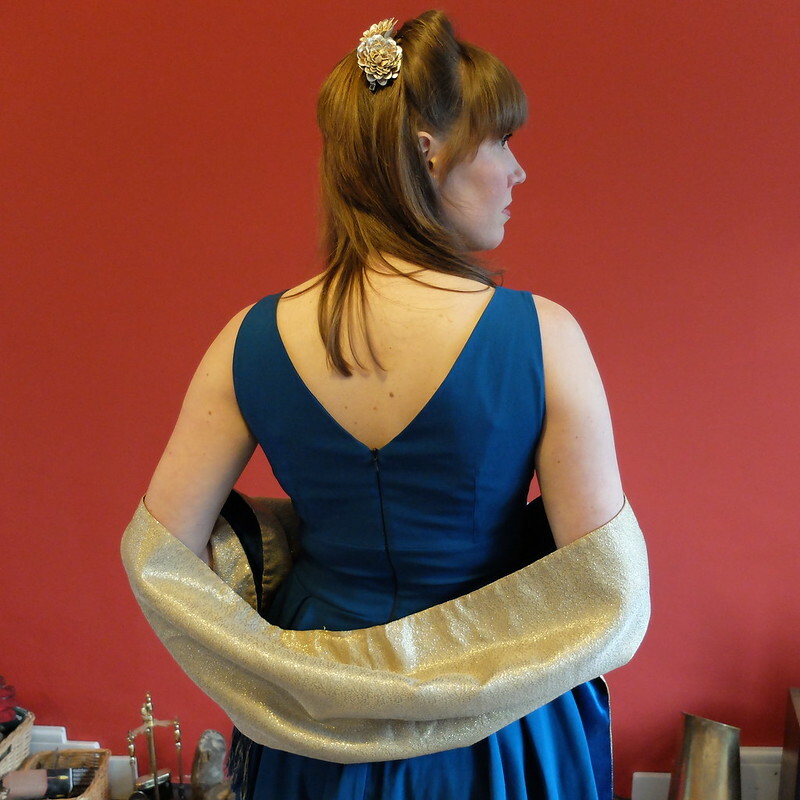 I recently wore it to the National Theatre Awards in Cardiff, and before I headed out I had time for a few quick photos, so I can share my review of the dress with you all. I'm afraid there wasn't time before I caught my train for a glamorous backdrop, so this is more of a review than an 'outfit post'. 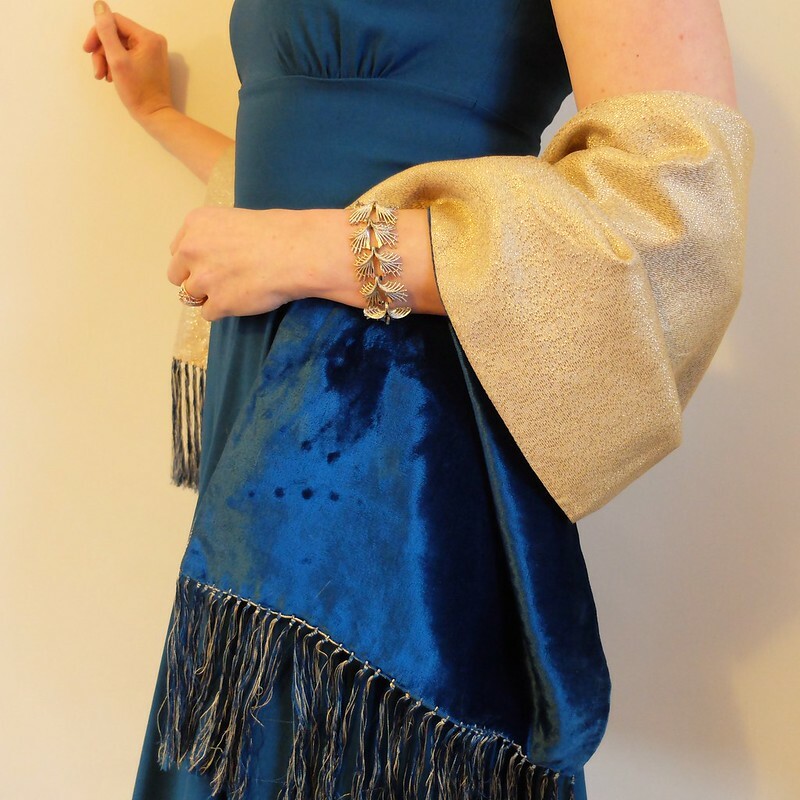 The beautiful vintage '50s or '60s stole was picked up in West Wales at the end of last year, and has blue velvet on one side and gold lamé on the other, and tassels on the ends. Perfection! The stockings have gold seams, which you can just about make out if you look closely. They were a new purchase from What Katie Did, bought especially for this occasion. They really do have a lovely sparkle, but it's fairly subtle unless you're moving and they catch the light. On to the dress - it really does give a beautiful silhouette, nipping in the waist and the pleats providing a fullness to the skirt. I like the boat neckline, and the v-neckline to the back. It felt wonderful to wear, and didn't crumple or crease too much over the evening. I went without a petticoat, but you could certainly wear one for extra oomph. The quality is beyond reproach. No loose threads, sticky zips, unsuitable fabric, weird cut or anything else. Sizing wise, as a general rule at House of Foxy, if the fabric has stretch then a 12 is perfect for me, but I have to go up to a 14 for non-stretch garments. 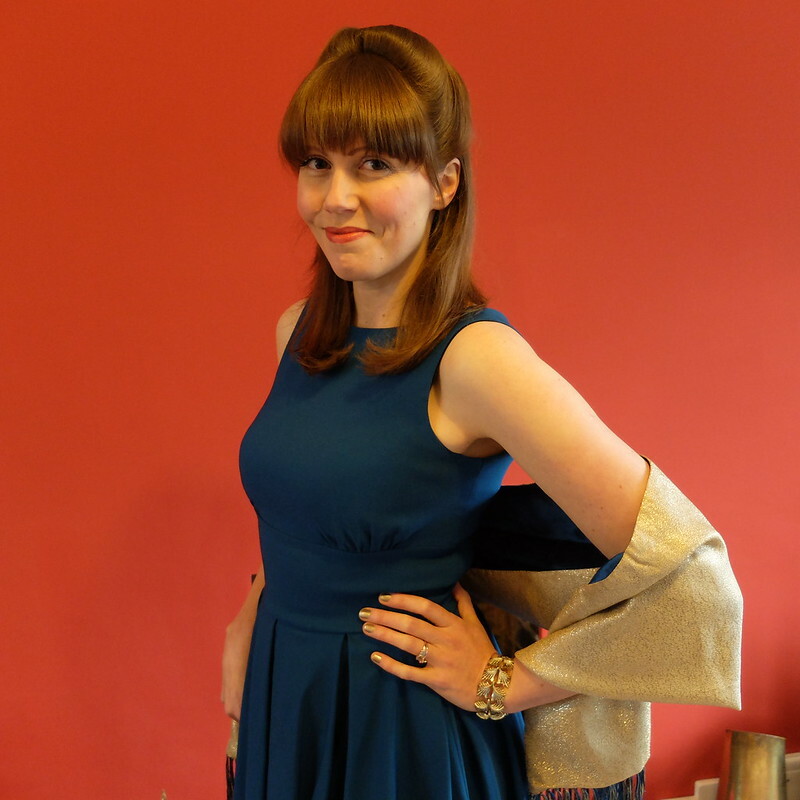 The same was true with the Betty dress, with a 12 proving the perfect fit in the stretch benagaline type fabric. The length is excellent, well below my knees, but if you're shorter than me (5'9") then you may find hemming required. At full price the dress would have been £95, and I picked it up for £65. At the sale final reduction it went down to £47, which if you were lucky enough that it was left in your size would have been a steal. 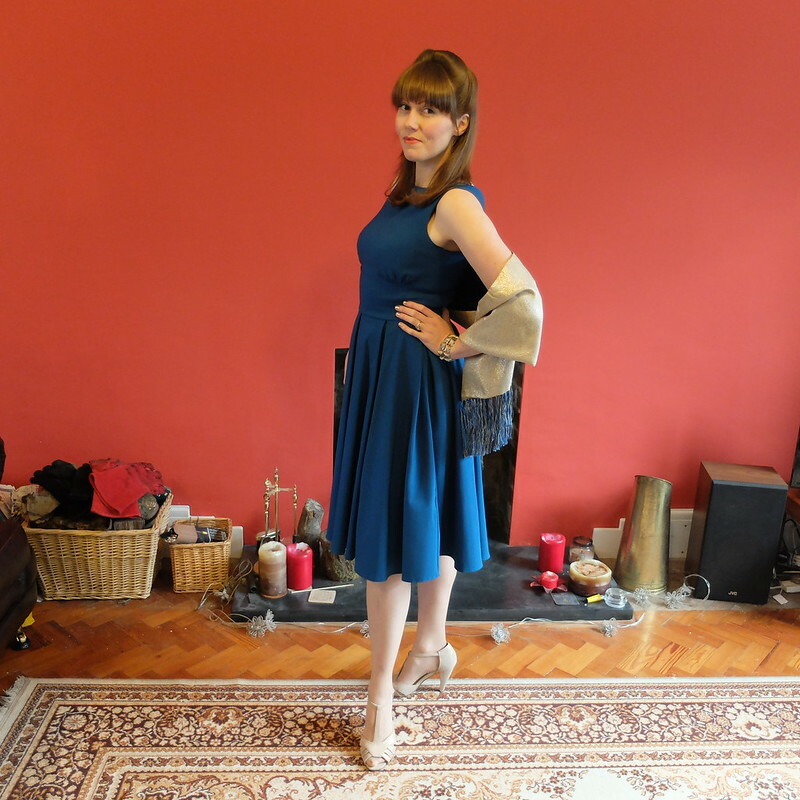 I do struggle a bit to justify buying dresses once we get to the £100 mark, but that's simply me working out cost per wear, and with a party dress that's going to remain fairly high compared to separates that you can wear to work every week. Their separates in particular are excellent value. I do have a rule 'never pay full price for anything' so I generally wait for some kind of offer giving 10% or 20% off. You might be waiting a while though with House of Foxy, as they rarely have offers or discounts, and don't have any 'welcome' discounts for new customers. This means that their limited editions do sell out - so if you really fall in love with something, don't dally too much! 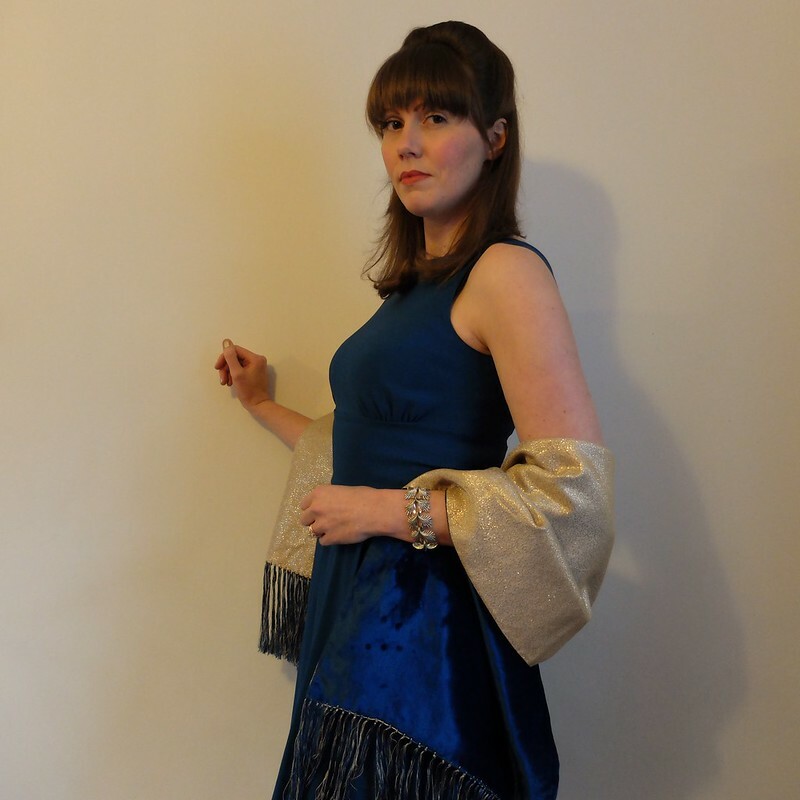 The House of Foxy tend to reissue dresses in different fabrics, so even if they sell out of this incarnation, keep an eye out for reissues in future that will be very similar. I'm really pleased with the classic shape of this dress, and am already planning to wear it again in the Spring for a wedding. What price tag do you start to wince at for dresses? And do you always wait for discounts before splurging? Anyway, you look absolutely Gorgeous, with a capital G! I absolutely love this dress on you and the gold accessories are perfection. You can be my date for an awards ceremony any time! This is a really beautiful outfit. I love the accents you wore with the dress especially the gold seamed stockings! What a great deal you got on the dress too! I think having a great deal makes me love things just a little bit more than if I'd paid full price...!! Never buy anything full price... unless I have gone through several sleepless nights thinking about the garment ! That blue color looks beautiful as the shape of the dress - and I also like your hair. This makes a lovely outfit and it does look like a good quality dress. I try my hardest to avoid purchasing any retail at full price. As an avid thrifter this is becoming easier although I still find myself sometimes lured into purchasing footwear at full price. Happy feet = Happy Suzanne. This is gorgeous on you, especially with the gold accessories and those underpinnings! Wonderful! I love your stole, shoes and stockings...beautiful! I always try to wait for discounts or put things on a lay-by/payment plan if I can! Ay caramba, those stockings! 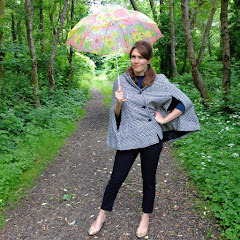 (I'd have stuck my finger straight through them, I'm a nightmare with sheers...) Great co-ordination with the stole too. I always wait for discounts with Boden because they do too many. I've got quite a long Etsy Love list and often a reduction there too will sway me into buying things. With firms like Heyday! and House of Foxy, I'm more likely to pay full price, because they're small and manufacture in Britain, so I don't mind paying the extra. That said, I'd probably have balked at Foxy's prices if I hadn't been given a dress for Christmas; now I've seen the quality for myself I'll definitely shop more with them. This dress is so gorgeous on you, I really do love it when you do a 60s look - suits you to perfection. Also - I WANT THOSE SPARKLY STOCKINGS!!!! House of Foxy are a fantastic company, definitely on the very high end of vintage reproduction brands. While I do love a good bargain like everyone else, these days I try not to wince at the price if it is something I truly love, and a good quality piece that I know I will get a lot of wear from for years to come. That said - bargains are awesome and I like to wait around for things to go on sale when possible. Oh, this dress fits you perfectly and it looks gorgeous with the gold accessories. Those stockings are just so fabulous! I hadn't spotted them on WKD, I might have to buy myself a pair. Anything over £20 and I have to seriously consider and never new. I don't know how I'd cope if I went somewhere and someone else was wearing the same thing as they'd bound to look better than me! I think 100£ is a lot for a dress - especially since I'm paying in euros and it costs even more for me. 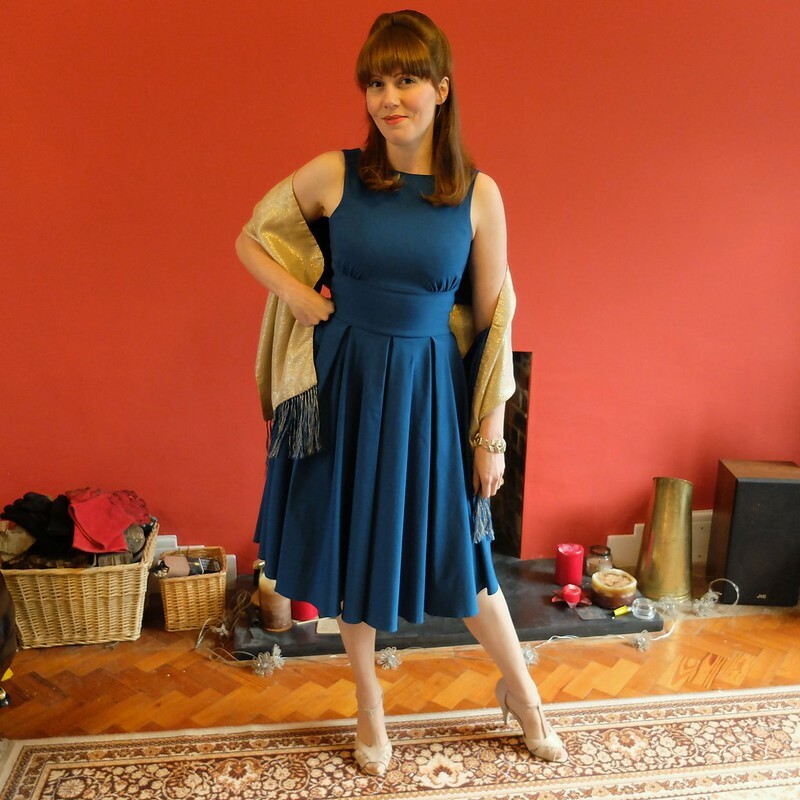 I do have a couple of dresses that cost 100-150 euros and I adore them, but I think I draw the line at my 89£ Vivien of Holloway dresses mostly. Those I bought when they cost ~100-110euros instead of the 125ish they are now. But now that I looked at House of Foxy I found items I really, really, really want... But they're so expensive I don't know if it's a good idea to buy them even though I'm currently working... I guess I really need to sell some of my older dresses away to make room for new ones (and to justify being them at all!). I'm with the majority above, I couldn't face spending £100 on a dress. Off the top of my head I can't think what the most I have ever spent is, might have been on my Vivian of Holloway dress but even that was in the sale! Amazing outfit! I love the combo of that stole and those shoes with that dress and those stockings are so amazing! So glamorous!!!! Gorgeous dress on you too! It fits you absolutely perfectly! Great find at a great price! I'm a bit funny about buying dresses. Most dresses I buy these days are Trashy Diva and they tend to run about $180 a dress new. I used to wait until big sales to buy them but I've found with TD they are the only brand that I really will regret letting a dress go so I've found for me it's better to buy it when I see it and while it's still in stock... but like I said, I'm a bit funny about buying dresses... all other brands I really hem and haw before buying them no matter the price whether it's $20 in a swap and sell group or it's under $100 on sale. Hello! I found your blog post while researching information about House of Foxy dresses. As a potential US customer, I really want to get the sizing right before I order, especially since I'm looking at a no-stretch dress. Do you mind sharing your waist and bust measurements? Mine are right at what the website lists for a Size 10, but I don't want things to be too tight. Thanks!